The two buildings are only about 3.5 miles apart, but I didn’t want to end up lost and figured a cab would be the right way to go. The drive there took a tad longer than I had expected as we navigated the numerous one-way streets of the French Quarter and then traveled through several neighborhoods that were still showing signs of the destruction wrought by Hurricane Katrina. It was a rather jarring reminder that – despite the signs of improvement in the French Quarter – New Orleans has still not fully recovered. My plan worked like a charm, and we ended up lost in a cluster of industrial buildings, driving up and down rocky, uneven roads. 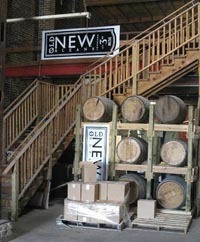 Eventually we found ourselves on the other side of the tracks (literally) and after some searching about, we finally found a modest warehouse on Frenchmen Street in the Gentilly neighborhood with a sign for Old New Orleans Rum, and figured we’d found the right place. My cab driver gave me his phone number so that I could easily get a ride back (for those of you who wish to go on this tour, I later learned that the friendly people at Celebration Distillation will be more than happy to arrange a taxi back to your hotel), and I ventured inside the open warehouse. 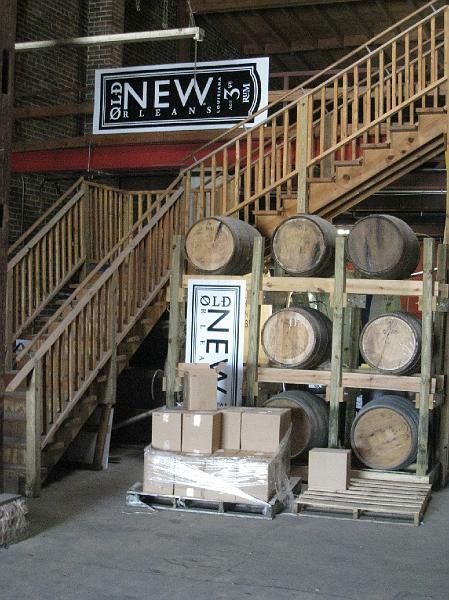 Stepping through the office door, I wandered directly in to the tasting area, where I ran in to Ben Gersh – General Manager for Old New Orleans rum. Ben seemed to be in a hurry (he was preparing to leave for a session at Tales), but stopped and asked me if I was there for a tour. When I responded that I was, he directed me to join one that had just started – pointing in the direction of 2 men being led by another gentleman through the distillery. The interior of the warehouse was filled with barrels and equipment. The rums produced by Celebration are distilled and aged all within the walls of this dusty warehouse. 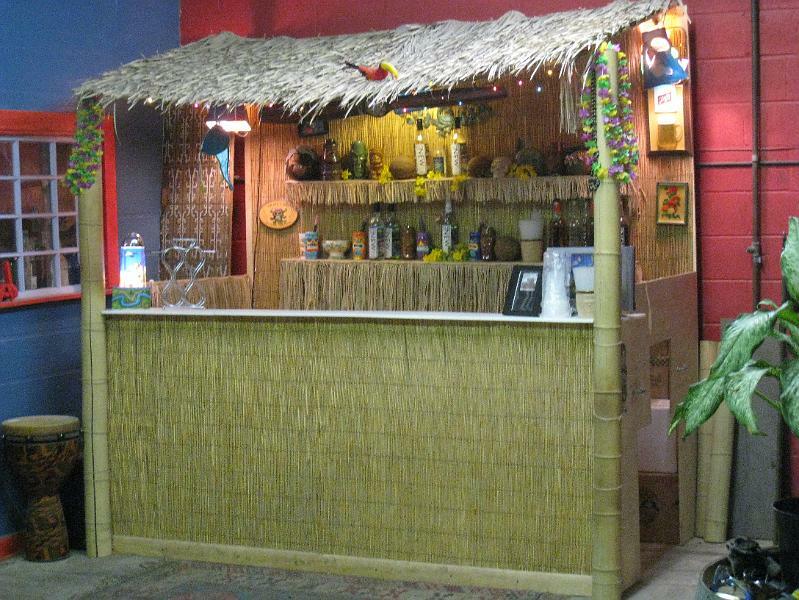 There are a few tables scattered about for filling out paperwork, and a small tiki-style bar next door to the blending room. Looking around the distillery you’d never guess that during Hurricane Katrina this building was filled with water to heights more than twice my own, causing extensive damage and loss. That still is the original still purchased by owner James Michalopoulos on a trip to Europe. The still was not originally designed for producing spirits, but rather perfume. Michalopoulos purchased the still with no real spirit in mind – just a desire to create a spirit from local produce in New Orleans. 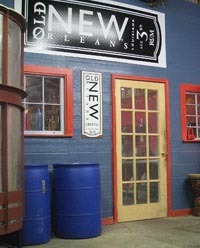 Once back in New Orleans, he found himself surrounded by sugar cane fields and the choice was obvious: New Orleans Rum. Prior to Katrina, Celebration Distillation had been producing rum for about 10 years. After the distillery was nearly wiped out in 2005, Michalopoulos didn’t surrender. Like the city, he started the process of rebuilding. Upon catching up to the tour, I was introduced to Chris Sule, the head distiller for Celebration. Chris joined the distillery after Hurricane Katrina, coming not from a distilling background, but rather one of brewing beer. Chris explained that all the rums produced in the distillery are produced in 500 gallon batches. He pointed out the new pot still, which is actually a converted brewing tank. According to Chris, the difference in shape from a traditional pot still imparts a lot of “candy flavors” into the rums produced here. Chris escorted three of us through the distillery, stopping to show us the equipment used at each step of the process. He even allowed us to sample the distillate and the varying stages, including a finger taste of the 185-proof distillate, and sipping the 150-proof – both of which were actually rather fruity and flavorful. Next we sampled the batch of 5-year-old single barrel (not available in stores…or anywhere other than from Chris himself actually), which was spicy but smooth, with notes of caramel, pear, cloves, and a peppery finish. From there, Chris took us in to the blending room – which is one of only 2 spaces in the entire distillery with air conditioning (the other space being the office/tasting room). In the blending room, Chris explained more of his philosophy on creating rum – a philosophy of “taste, not science”. Chris then pulled out a bottle of the Old New Orleans 10 Year Old – yet another product of Katrina. As the story goes, upon returning to the distillery after the hurricane, the staff discovered several barrels of old stock floating around the room. As it turned out, some of these barrels were from the distilleries initial batches. 17 barrels of 10 year old stock were blended into a single rum to create the premier item of the Old New Orleans line of rums – available only at the distillery and select bars and restaurants. Shortly after explaining this that Chris apologized, saying that he had to run to Tales of the Cocktail for a presentation. He thanked the three of us for coming and was whisked away by Ben Gersh, leaving only poor Cassidy to deal with a blogger with a notepad and an insatiable thirst for rum. As with any distillery tour worth its salt, one of the highlights of the Celebration Distillation tour is the time in the tasting room. I bellied up to the bar and Cassidy began pulling out bottles and cups. As she poured each rum, she gave a little background on how the rum was created, as well as the people involved (Celebration Distillation has a kickball team?). 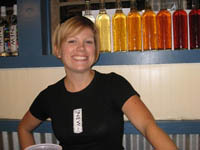 As we worked our way through the entire line, Cassidy also made a few of the distillery’s signature cocktails, including the New Orleans Cajun Iced Tea. A dangerously tasty and equally powerful drink, it definitely hit the spot on such a hot day. Add the rum and simple syrup, and then fill the glass with unsweetened iced tea. Stir and serve with lemon garnish. After chatting for nearly 90 minutes with my new best friend, I looked at my watch and realized that I needed to hit the road to make it back to the Monteleone in time for my next session. I called my cab driver and told him I was ready, thanked Cassidy, and set about to take a few additional pictures. The visit to the distillery was easily one of the highlights of my time in New Orleans. 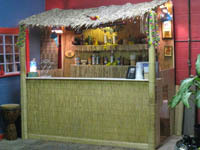 The staff are friendly and fun, you’ll learn a lot about rum, and you even get to have some great cocktails. This tour is definitely something everyone should consider a must-do event when in the Crescent City. 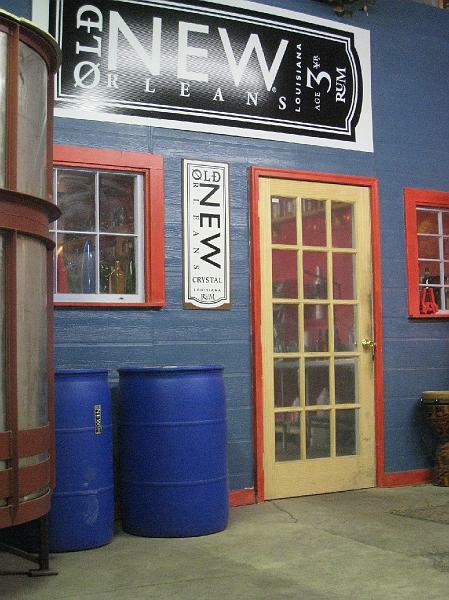 Have you visited the Old New Orleans Rum distillery or tried their rums? Got interesting recipes? Share your thoughts and recipes in the forums!